Judith enjoys disconcerting herself and others with chilling stories from near and far. A dog in a car isn't a natural state of affairs, so it's no wonder that many dogs don't enjoy car travel. Some show their unhappiness by howling or barking, some chew the seats and others are simply sick. Occasionally dogs love to travel, but get so excited at the prospect of a car journey that they too leap around, chew and bark. None of this behaviour is good for either you or the dog; in fact, it's a distracting and therefore dangerous situation. If your attention is being drawn to your back seat, you aren't giving your full attention to the road, and that could cause an accident. If you are planning a long journey with your pet, don't assume that he will be a model passenger. It is your job to train him to behave during your journey and to plan your trip taking his needs into account. The result will be a happy dog and a safe journey. By making an early start, I don't mean set your alarm clock at 5 am on the day of your trip, I mean start training your dog to love car travel as soon as you get him. You can't expect a dog who has never been in a car, or who has travelled only rarely, to adjust immediately to a long trip. Instead, introduce your puppy to the car and do it regularly. If you have a nervous puppy who doesn't like loud noises or new situations, try putting him in the car for a really short amount of time without even turning the engine on. Build up the time slowly and when he is happy with that, start the engine. Again, go slowly with a nervy pup. You don't need to go anywhere, just sit on the drive for a while with the engine running. Then graduate to short journeys to the store. 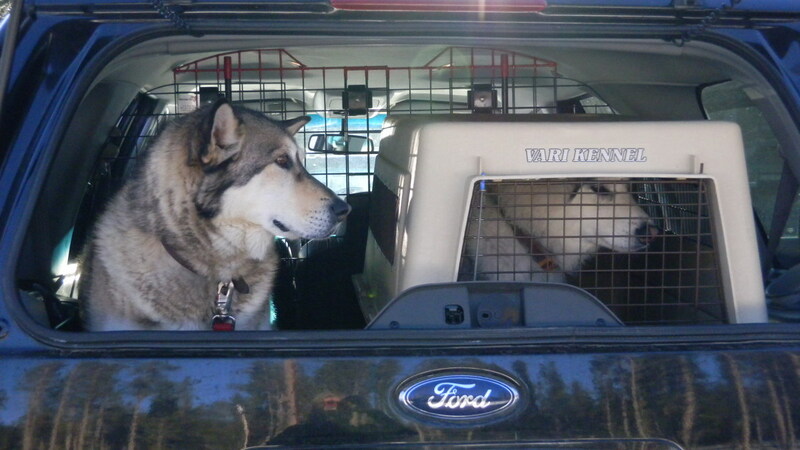 Over time your dog will accept car travel and be ready to cope with a long journey. Dogs are creatures of habit and your dog is likely to accept a trip in the car if he finds his surroundings familiar and fun. With this in mind, put a familiar toy or blanket in the car for him. If you use a crate in the house and it will fit in the car, put that in for him to sleep in. Give him a treat to munch when he gets in to the car and praise good behaviour, just as you do around the house. Don't scold "bad" behaviour like barking. Instead, work on your "quiet!" command when you are in the house, and use it in the car, making sure you follow it up with praise. 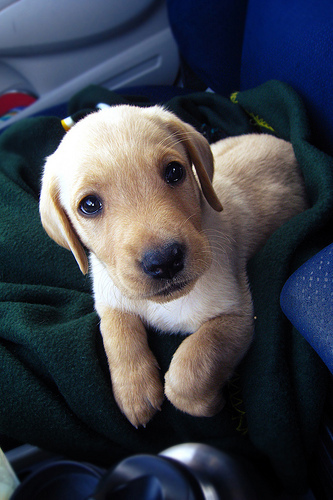 Try not to get frustrated or annoyed in the car as dogs pick up emotions quickly. If you are happy and confident your dog is likely to be too. Conversely, if you are nervous and anxious, your dog will follow suit. If you plan to get up on the day of your journey, breakfast and then set off, think again. 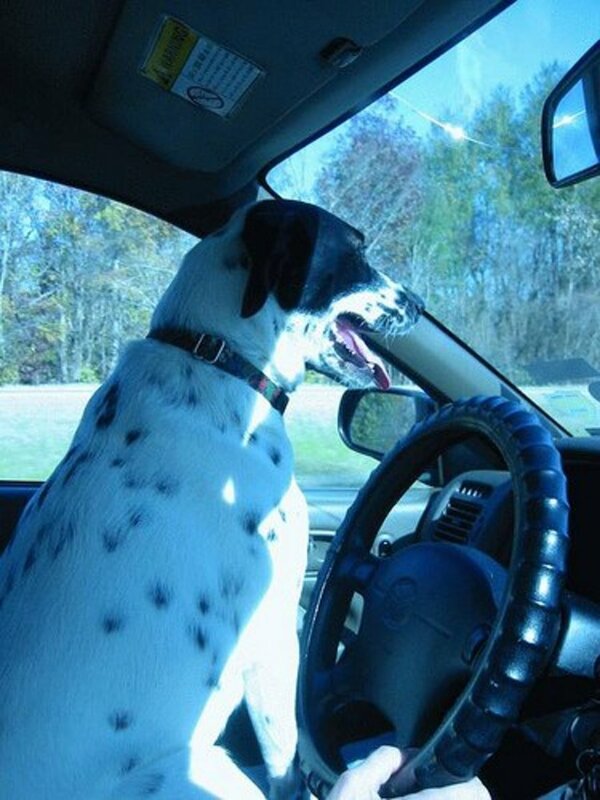 Your dog will be a far better passenger if he is not full of energy and consequently bored. Make time to exercise him before you set off, even if that means getting up early. And don't make a half-hearted jog around the block, making it just long enough for him to go to the toilet. Have a proper walk, or better still, run. This will pay off in the long run as your dog will be far more willing to lie down and be quiet on the journey. Keep your dog safe whatever the weather, plus find out what to keep in a dog's first aid kit in my "Hub of the Day": Winter Dog Walks: Keep Safe and Healthy. Sometimes you see dogs travelling in the backs of trucks or sticking their heads out of car windows and it does look like they are having a good time. However, you should have your dog restrained properly in the car, just like you have your other passengers safe with seatbelts. If you had to brake suddenly and your dog was not safely restrained, he could hurtle forwards injuring not just himself but anyone he crashed into. Whichever method suits you best, make sure that you introduce it to your dog well in advance of your journey. To fail to do so will result in an unhappy dog who will make the journey miserable not only for himself, but for you. 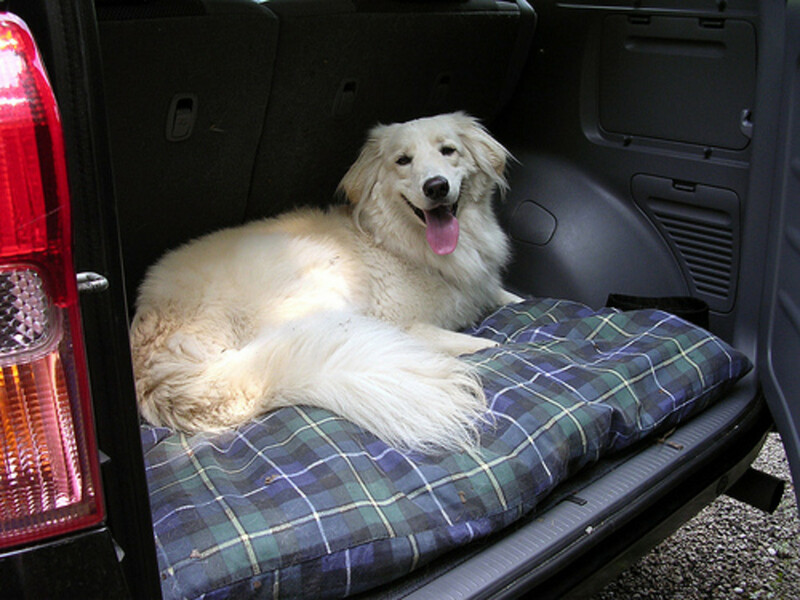 If you are using a dog guard, put a blanket or bed in the back so that your dog feels comfortable. 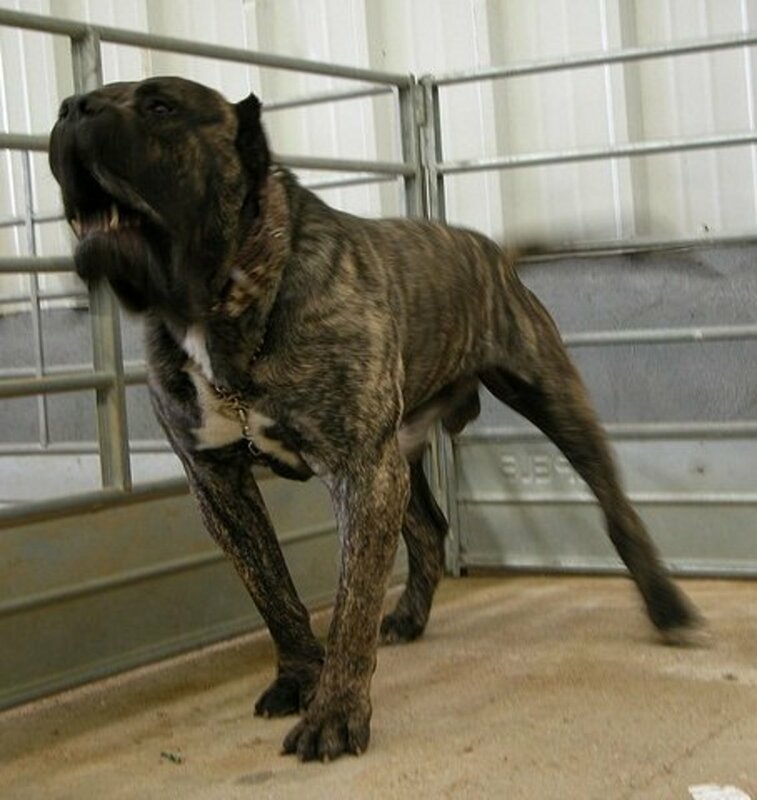 Ensure that the guard is fitted properly and will not collapse if your dog pushes against it. Crates or carriers can be used in the house for short periods before the journey to let you dog get used to resting in them. 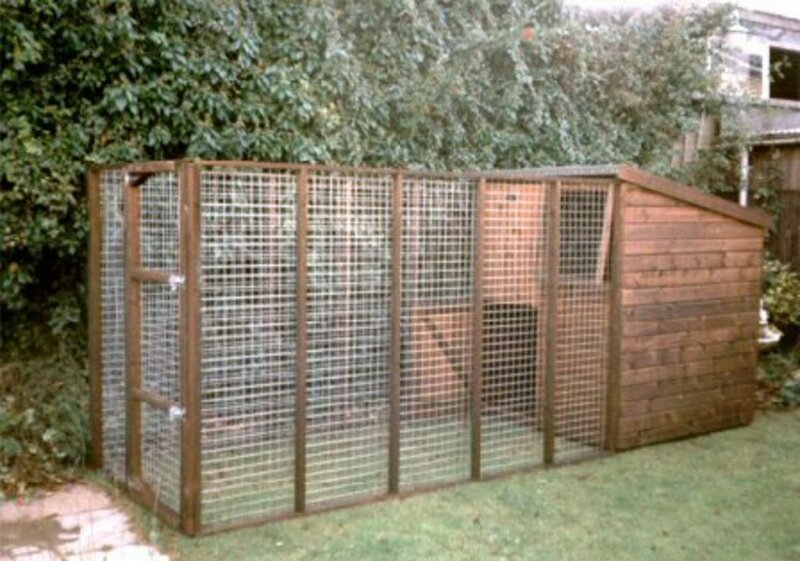 Don't ever lock a dog into a crate; the crate should feel like a welcome sanctuary, not a prison. If the dog feels happy in his crate, your journey will run all the more smoothly. 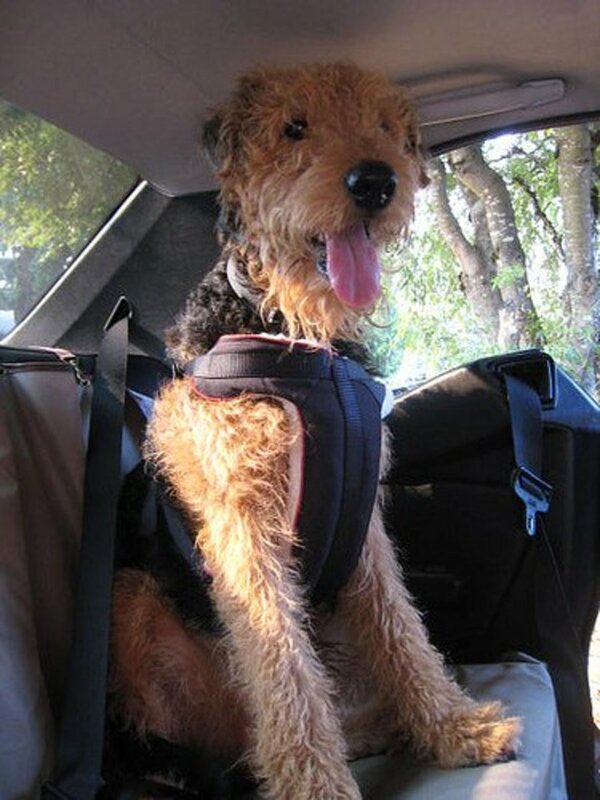 Many dog harnesses are designed to double up as a seat belt harness. Therefore, you can start walking your dog with the harness so that he is accustomed to the feel of it. He should more easily accept being attached to the seat belt if he doesn't mind the feel of the harness. You might consider putting a blanket on the seat to protect your car seats. Have a look at your route and plan in some stops to allow your dog to stretch his legs, have a drink and a toilet break. This is good practice for drivers too! Don't stop at the side of the highway or motorway if you can avoid it. An over excited dog and roaring traffic don't mix; accidents happen and you don't want your dog getting loose on a busy road. Instead, plan to pull off into rest areas or away from the highway. When you are packing for a long journey it is easy to forget to pack things. Don't overlook your dog. Remember to pack water, some food and bowls. Take a first aid kit (don't share yours!). 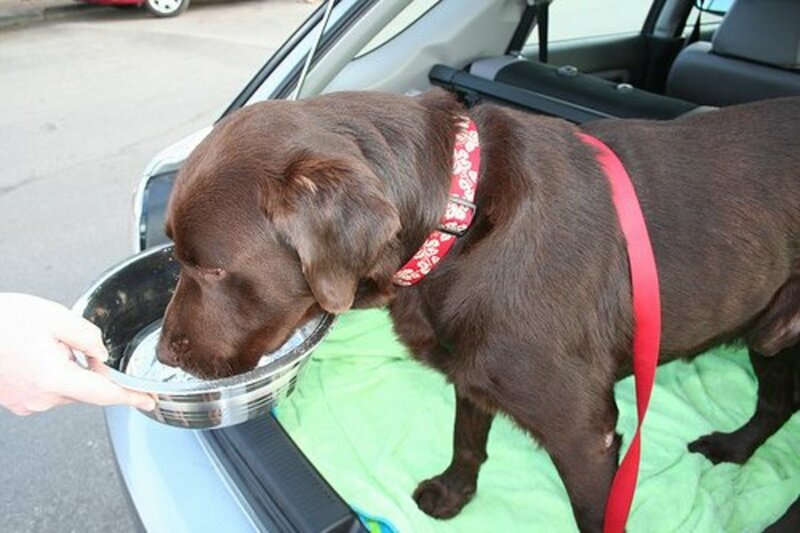 If you are planning to stop and do some sightseeing and leave the dog in the car, remember that dogs overheat in cars very quickly; don't let this happen to your dog. You should have insurance for your dog anyway, but make sure that you have it before you go on a journey. It is when we are out of our regular routine that things are more likely to go wrong, and it is better to have one less thing to worry about. Hi Jim and Laura - yes, can't believe how many people think it's OK for dogs to stay in all day and then wonder why they rip the house apart! Thanks very much for taking the time to comment - much appreciated! Great content and beautiful photos! We so agree...a tired dog is a happy dog. Too many dogs don't get enough exercise. @ John Redd - sorry not to have replied, but only just found this comment in my spam filter! Thanks anyway! Hi Suelynn - glad you enjoyed reading this hub, I was delighted that it was a HOTD. I just realised I never said thanks for answering my question! I'm loving this hub, the photos and all the ideas about how to keep a doggie happy on a long trip. Voted up and shared. Hi jasper420 - I really hope you can help your dog enjoy travelling, it's so much less stress for everyone. Good luck! Great tips very useful info my dog hates car trips I will try your tips. Well put together! Great traveling tips for taking your dog along. I had never thought of a first aid kit. Thanks. Love the pictures! Thumbs up. Hi Audrey - glad to hear that you dog is still enjoying travelling. Hi Millionaire Tips - I think that there are lots of dogs like yours, mine does bark a little bit if she knows that we are going somewhere fun. Congratulations on hub of the day! Well deserved. These are great tips on traveling with a dog. My dog loves to go places, although he whines the whole way there, probably saying "are we there yet?" He is quiet on the way back though, so it isn't my driving he is complaining about! Hi picadilly - glad you found enjoyed this hub. Hi billybuc - yes, there are a lot of comments, it's taking a while to answer them all! Hi Dog Advisor - so glad you found this hub informative. You are right, dogs can have a very reassuring presence. Your journey sounds a complete nightmare though. Hi John Redd - you are very kind! Hi inaniLoquence - I hope that you will be able to make use of this information in future. Hi idratherbe - thanks for your comments, glad you found this useful. Hi plussize-lingerie - oh, that is funny! Our dog often tries to invite herself into other people's houses, but never a car! Hi Just History - good point about keeping children and dogs separate. Hope that your nephew's dogs make it safely to Cyprus, I am sure that they will. Great advice!!! My dog fortunately loves to travel..the insurance is a great idea!!! Thank you for sharing!! I thought I had already commented on this hub but turns out otherwise. I found this hub from your facebook and I'm going to share it with friends who have dogs. Surely there will be a lot of happy pooches secretly thanking you for writing this hub! Nicely done and congratulations for HOTD. You deserve it. Wow! Look at all of the comments. Congratulations on being the Hub of the Day. Now that I have read it I can see why. What useful information! Loved it, I am so lucky that my Daisy loves to go for a car ride. She always picks up all the cues that I am about to be in the car. She is excited at first but quickly calms down. Occasionally, she will see something or one if there is traffic...She was actually my 'sanity' when I got caught 350 miles from home when a freak snowstorm arrived. I had to work at 8am the next day with no-one to cover me. Daisy and I drove for 14 hours on a 6 hour trip. Reassuring Daisy kept me sane. Oh, a wonderful hub from Judi. I should have known these tips ahead for my dog. Thank you Judi. Extremely useful and informative hub. voted up. Our black Lab loves the car. So much so that he tries to jump into the boot whenever you open it, even if it's the other car which isn't a hatchback. In fact he's been known to jump into other people's cars in the hope of a trip. Which rather surprised the woman who's car it was as we walked past! Excellent hub, btw. Well worth Hub of the Day. Great hub, I didn't realise that you could buy seat belts for dogs! Safety is important- also if you have a young child it is good to separate the dogs from the child- as you say you need your eyes on the road, not turning around to look for where the noise is coming from. My nephews dogs are going by air to Cyprus next week to join him and his family- I expect (and hope) that the crating people know what they are doing! Hi Flora - that would have been a great skit to see! I do like the photo so much too. Hi thoughforce - I am pleased that you found this hub useful and enjoyed the photos - I enjoyed writing it and choosing pictures. Hi vespawoolf - so true about dogs and children! Yes, Bogart Handsome Devil is an adorable boy. He actually looks just like my dog, which is a shame because she is a girl! It's the beard that lets her down! Hi urmilashukla23 - glad that you found this useful and thanks for sharing. Hi Happyboomernurse - thank you very much for your kind comments. I am thrilled to have HOTD. Love this Hub. Congrats on Hub of the Day! My little miniature schnauzer loves to ride in the car. She gets her feelings hurt if I have to leave her behind. Our other dog is getting ready to fly on an airplane for the first time, hope that goes well. I wrote a hub about getting her doggie carrier ready for the trip. Read mine when you have some time, OK? I voted this UP, etc.etc. Congratulations on Hub of the day. The first picture reminds me of a skit on Just For Laughs: Gags in which there was a dog driving a mail truck. What onlookers didn't know is that there was a man controlling it by remote control. One of the actors went up to the dog and gave the dog directions and then the dog "drove" off. Congratulations on having the hub of the day, this is a very good hub with many useful tips. I have had several dogs, and some did loved car journeys and some wasn't so eager to jump in so I have tried different ways to make them enjoy it more. You have covered the topic very well, and the pictures are wonderful! Congraulations on Hub of the Day! The pictures and information are great. I think the same tips would apply to traveling with children, as well. : )I've never seen a dog safety harness before. Too adorable! Hi Moon Willow Lake - we weren't intending to get our dog, but gave in to our daughter. In the event, my husband and I spend far more time with the dog than she does! Great tips for dog owners! Congratulations on Hub of the day award. Bookmarked, shared, voted up and useful! Take care. Hi Jason - I hadn't thought of the movement of the car making a puppy sleepy, again it's very like kids - babies fall asleep in cars so easily. Great hub with important information for dog owners so that they can keep their pets safe and content and also help protect their own lives and the lives of their family members by preventing accidents that can be caused by an unruly, unhappy pet. Congratulations on earning the Hub of the Day Accolade with this worthy hub. Hi Shea duane - the tight belts must make them more secure. Someone did a great hub a while ago about "thunder vests" which you can use if you dog is anxious. We do not have a dog now, but with how much my young son loves them, I'm thinking there will be one in our future when he is older. This is very useful information to know as I've never been one to really be around dogs all that much. I did not know that a harness can double as a way to keep them safe with a seat-belt, so thank-you for that and all of the other information you provided. I will keep all this in mind for the future. My pit boxer mix loves the car. When he was a puppy under a year old, I had to take several trips back home which was an 8 hour drive! He slept the whole time and only needed to take a few potty breaks in between despite being an energetic playful dog. I think the key is being on the highway, the smooth ride and vibrations just puts him to sleep. A good run before hand always helps put em to sleep too! I would suggest starting early with anything you plan on doing with your dog! Hi hobbitinspiration - it's always good to be prepared! I don't have a dog yet but now I'll know what to do! Thanks! Hi Tammy - the photos are great, aren't they! Great hub with some useful information. Love the photos. Congratulations on having the hub of the day! Hi Deborah - glad to hear that your dog is a fan of car travel. My dog looks like the dog on the back seat of the car with the harness on (except that dog is sitting still!). Great to hear that you can make use of these tips. Hey, Judi Bee, congrats on Hub of the Day! The dog in the first picture looks like mine. She likes to go for rides in the car, but I've never taken her too far from home, yet. I will remember these great tips for our first long journey. Hi Marisa - wow, 15 hours is a long trip! Glad to hear that your sister-in-law has it all worked out. Hi snagerries - I hope that you can help your dog feel more comfortable travelling and that this hub will help. 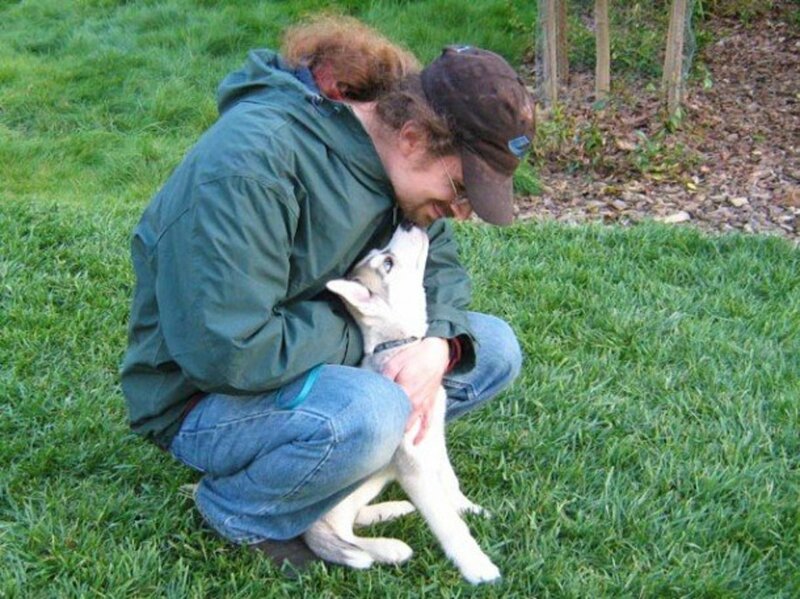 Hi kelleyward - I agree totally about kids and dogs, there are lots of similarities! Hi jaybird22 - glad that I have been able to useful to you and your dog! 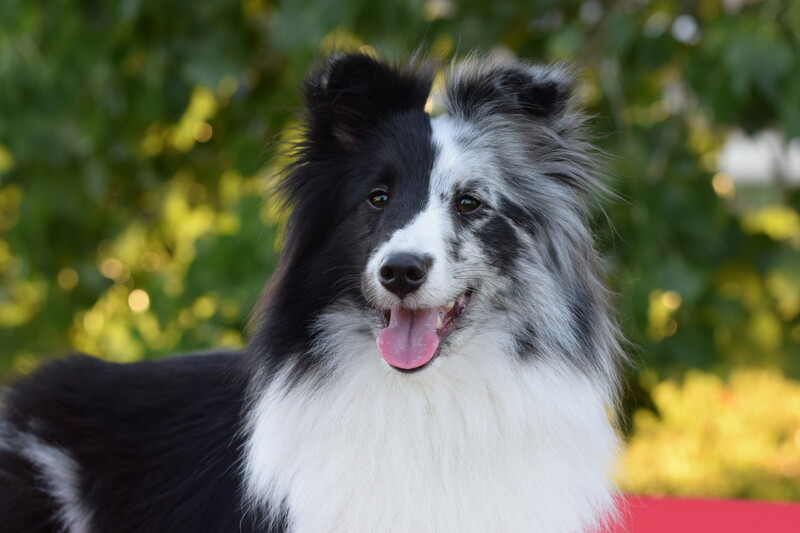 Hi bizzymom - our dog is very energetic and when she was young we lived by the mantra "a tired puppy is a good puppy", so lots of fun and activities, and she didn't have so much energy for mischief! Hi Linda - I hope that you can make some use of this advice, it's nice to be able to travel with a happy dog! Hi the girls - our dog is definitely part of the family too. She would like to be the head of the family, but she is gradually accepting that she isn't! Hi HendrikDB - glad to hear that you were able to work out your dogs' problems. Our dog doesn't like fireworks and I think that we may have to sedate her next time 5 November rolls around. Hi hisandhers - glad to hear that your dog is happy travelling now. Hi Civil War Bob - I know it's bad, and against Health and Safety, but I can't help but smile when I see dogs with their heads out of the window! Hi Keri - I think the photo is luring in a few non-dog owners! Hi starstream - thank you! Bookmark it for later if it will help. Hi Deepak - you are very kind, I am glad that you found this useful. Hi Sannel - you are always welcome back! Hi Melovy - I read somewhere that people's dogs turn out like their children - well behaved children/well behaved dogs, so I guess there must be some similarities in bringing up either! 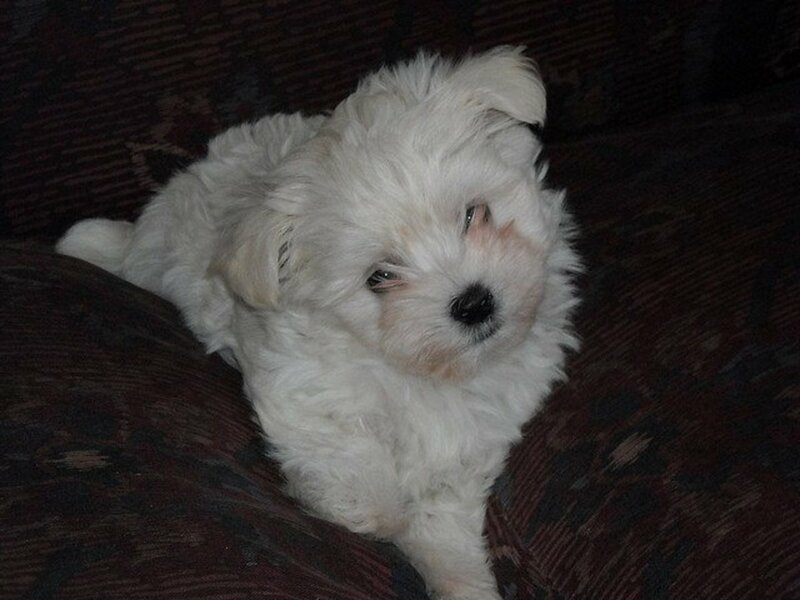 H Juliek - a puppy photo is always a winner! I am glad that you found this useful too! Hi MP50 - I had fun finding the photos, glad you like them! I don't think the dog has got a licence, I think he had a rebellious look! Excellent advice! My sister-in-law brings her dog with her when she and her family travel 15+ hours to come visit us; the dog crate and a familiar blanket have worked for the dog, along with frequent breaks. 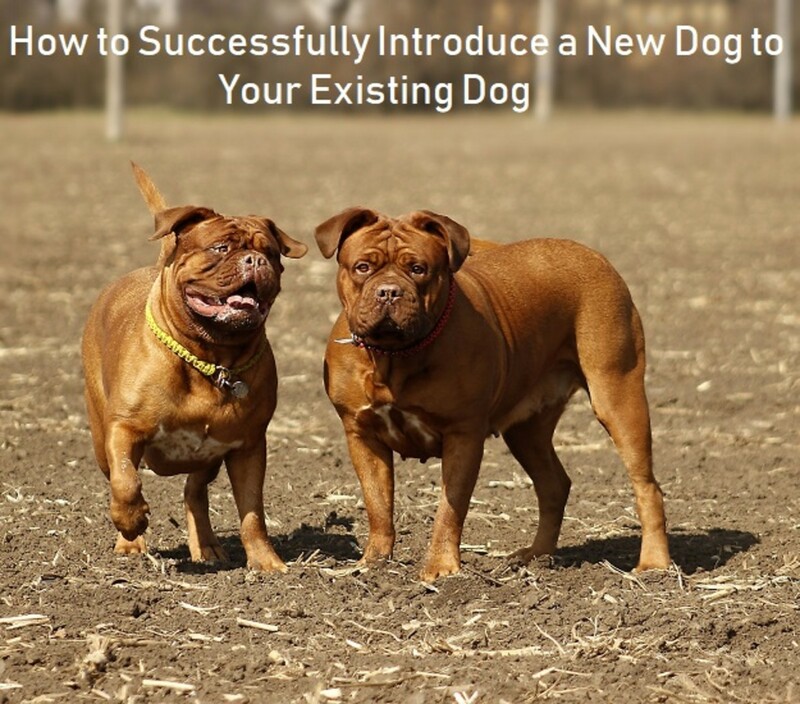 Excellent tips.My dog doesn't like to travel much in cars so this will surely help me. Congrats ! Traveling with dogs is similar to long car trips with young kids! Great hub! Great hub and excellent advice. I have a german shepard that is a pretty good traveler but you mentioned some tips that I have overlooked. Tips like getting in exercise before travel and bringing in toys into the vehicle. I haven't had to take him on a long journey yet but when the time arrives, I will use you advice. Thanks again! These are great tips. My Yorkie gets so excited when we tell her we are going "bye, bye", she can't wait to get into the car, but as soon as we are on the way, she becomes a nervous wreck! However, she is a much better passenger when she is tired. Thanks for sharing! Fantastic tips for doggy travelers! My dog doesn't like car trips so these ideas will come in handy. Congrats on Hub Of The Day Judith!! Good tips Judi. Our pet is part of the family and she always goes with us most of time. The farthest she has traveled by car is 50 miles away from home! Very good. I only had to transport my two little dogs over a longish distance (2 hours drive)twice now. So before hand I visited my Vet who gave me special tablets for digs to calm them down. It worked very well and there was no side-effects. They even enjoy the journeys. Oh wow I wish I had read this article years and years ago when my dog was a puppy. It took awhile to get her used to the car, but now she's very content to ride for any amount of time! I'm definitely voting this up. Congratulations on being Hub of the Day! My beagle used to love the wind on her face, but I kept her from getting too far out by only letting the window down a few inches and she was thrilled. Only down side was a drooled window! Good hub. Congrats on Hub of the Day! I don't have a dog, but was so drawn in by the top picture, I couldn't resist. Up & useful, I will pass tips on to my sister. Great hub! We have to remember our two dogs have different needs when we travel. They are two very opposite dogs. One is an obese Blue Heeler and the other a seven month old bulldog. We got spoiled by the Blue Heeler, the bulldog now needs a bit more attention when we travel. Yes, I will remember to read this hub again when taking a dog traveling in the car. Good tips and helpful information about training dogs to get used to just being in a car first. Fantastic hub....congrats for the award. and you helped me to keep my dog happy. very prestigious " Hub of the Day" award! Judi, You truly deserve this award! Well done!! We don’t have dog, but I loved the photo so much I had to come take a look.Congratulations on Hub of the Day! I too love the puppy photo! Excellent choice. I take my dog with me everywhere - at least all over town. We have yet to make a serious road trip together. Thanks for your suggestions. It will make a future trip together much more enjoyable.